The beautiful new S.S Antoinette is the crown jewel of the Uniworld fleet. Photo courtesy of Uniworld. 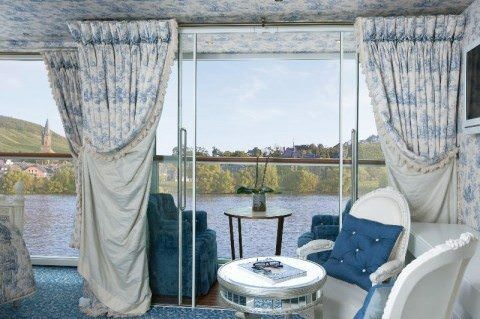 Launched in March 2011, the ss Antoinette is one of the most stunning vessels to sail for Uniworld River Cruises. While her physical dimensions are similar to those of her fleetmates, S.S Antoinette sets herself apart with her distinct interior features and amenities. She was named with the prefix “S.S.” for “Super Ship.” She was floated out at the end of December, 2010 and carries 162 guests. Rendering of one of the Suites aboard the ss Antoinette. 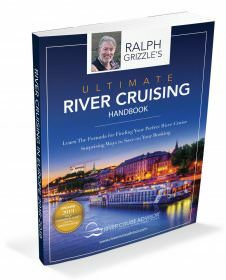 Illustration courtesy of Uniworld River Cruises. Guests sailing aboard ss Antoinette can choose between five stateroom categories and two suite categories. Staterooms and suites on Princess Deck feature full balconies, while staterooms on Duchess Deck feature French balconies with floor-to-ceiling windows that can be opened or closed with the push of a button. Lavishly appointed riverview staterooms and suites have handcrafted Savoir® of England beds draped in 100% Egyptian cotton linens and a menu of pillow choices. 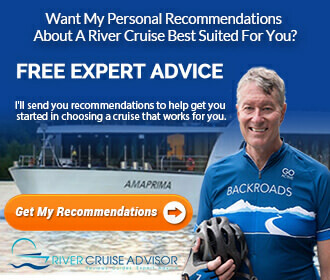 Stateroom and suite amenities include: generous built-in closets, hair dryer, individual climate-control thermostat, direct-dial telephone, flatscreen TV with infotainment center, and safe. Marble bathrooms include: L’Occitane en Provence and Hermés bath and body products, plush towels, special towel warmers, backlit magnifying mirror, heated mirrors, cozy bathrobes and slippers. All suites are uniquely decorated and have additional amenities and services, including: in-suite butler service; packing and unpacking assistance; in-room breakfast; daily fruit and cookie plate, and an elegant evening snack; iPod dock; Nespresso coffee machine and fine teas; fully stocked minibar; bottle of wine upon arrival; shoeshine; free laundry service; and a special dinner in L’Orangerie Sky Lounge. 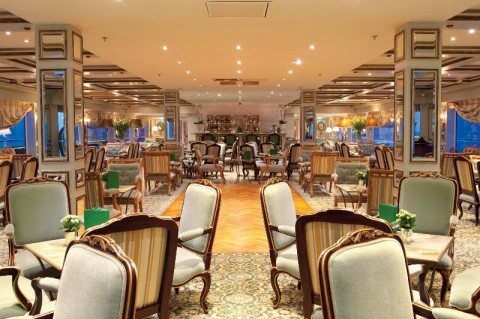 The gorgeous Grand Salon aboard ss Antoinette. Photo courtesy of Uniworld. When you step aboard ss Antoinette, the tone is set. 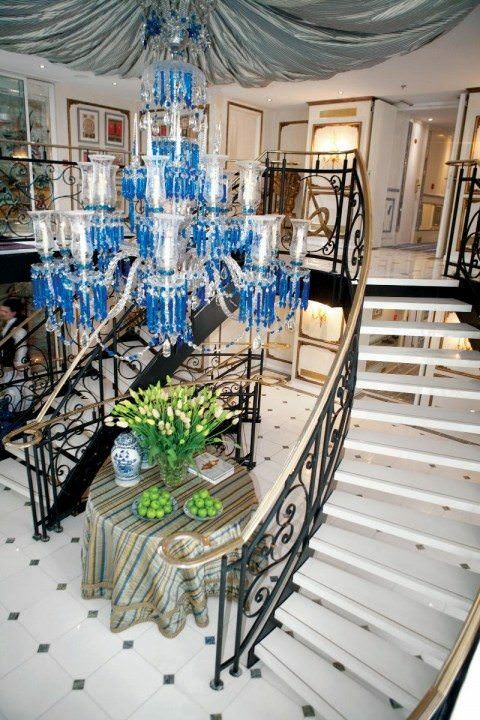 Designed in the style of Versailles, the ship features a blue Strauss 10-foot baccarat chandelier which once hung in New York’s historic Tavern on the Green. The theme of elegance continues throughout, with Brazilian marble representing the colors of the French flag imported to adorn the floors and walls. In a final nod to the palace made famous by Louis XIV, ss Antoinette includes a 19th century Venetian glass mirror set above the reception desk. The brilliant lobby aboard ss Antoinette makes a memorable first impression. Photo courtesy of Uniworld. 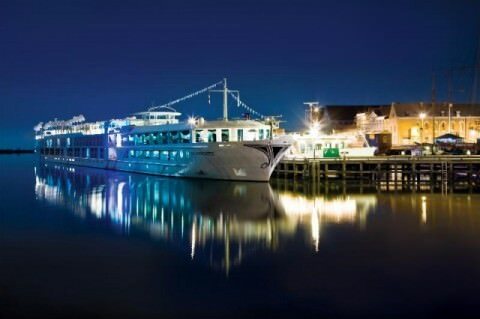 All the popular features of other Uniworld vessels are present here, including a main dining room and lounge, a library, a spa and fitness center, gift shop and elevator. An expansive sky deck allows for stunning views of the passing scenery. Unique to ss Antoinette is the new Leopard Lounge. Located all the way aft on the sun deck, the Leopard Lounge provides excellent views and is also available to suite guests for dinner. ss Antoinette also boasts a first for the river cruise industry: an onboard cinema. Capable of seating 20 guests, the Queen’s Lounge features plush seating and Dolby Surround sound technology, as well as popcorn and candies for your munching pleasure. Ashore, guests have use of Nordic walking sticks and bicycles. With her boutique styling and unique features, S. S Antoinette is poised to be one of the most interesting river ships to ply the waterways of Europe. The ship features an elevator for passenger use. The ship boasts one owner’s suite, eight regular suites, and 73 standard staterooms. Both 110 and 220 voltages are supported onboard. Read other articles about the ss Antoinette articles.